Many people wrote: "A lot of Stuff"
Nice posting going on here. As kool kitty pointed, a lot of factors can be considered when comparing the cards as a whole. About modding the cards, it sure is an interesting topic. If someone happens to have a modded sound card, recordings of it would be welcome, as long as the nature of the mod be specified. @Kool Kitty: I also like the fact that you mentioned the Sega Genesis. Doing the crystal clear audio mod for the Genesis 2 is one of my longer term project and maybe it could be adapted to some sound cards? About the genesis revisions, I did not know about " very late genesis models having a good analog circuitry ". To the best of my knowledge the late genesis all have a crap analog stage. The earliest model 1 remains the best sounding "stock" Genny i have heard. Can you provide more details about those "very late consoles" with good analog circuitry ? Going back to the Grand opl3 comparison run, I think that ultimately a full fledged point by point comparison of each cards would be very nice. I privilege the large scale, high quality, standardized FM recording part because it is the part that has never really been done before. If you search on the subject of fm sound cards on this forum or other places on the net, you will find some very good and detailed reviews and analysis of many cards but it all comes down to a lot of text, and very little audio. This is how i had the idea of starting this project, the audio part. This being said, even though standardized recording is the starting point here, ALL relevant DATA is welcome in this project. If we could end up with a central place that combines both relevant information and actual standardized recordings of the cards, it could become a very nice resource for old FM compatible sound cards. At this point, when i get a new card in my hand i try to consider all the following aspects. Basically ANYTHING relevant is welcome with this project. MaxWar wrote: @Kool Kitty: I also like the fact that you mentioned the Sega Genesis. Doing the crystal clear audio mod for the Genesis 2 is one of my longer term project and maybe it could be adapted to some sound cards? I believe the circuit was designed primarily for use with the Yamaha YM3438, be it the original Yamaha chip or Sega's modified ASIC variant used in the Genesis. Not sure what would need to be done to make the amp work with the YMF262. MaxWar wrote: About the genesis revisions, I did not know about " very late genesis models having a good analog circuitry ". To the best of my knowledge the late genesis all have a crap analog stage. The earliest model 1 remains the best sounding "stock" Genny i have heard. Can you provide more details about those "very late consoles" with good analog circuitry ? The late systems are Genesis Model 2s with motherboard revisions VA2, VA2.3, VA3 and VA4 that have good analog circuits, however, the volume levels are all over the place on the VA2 and VA2.3 motherboards due to incorrect resistor values and a misplaced resistor. Same with the Genesis 3 and Sega CDX, they all have good audio, though the former is Mono only. They still can't match a Genesis Model 1 due to the use of a YM3438 instead of a YM2612. The YM3438 has different volume levels and little to no quantization noise. I typically frown upon consoles with YM3438s as the Genesis first came with the YM2612, and since the two chips sound different, I will privilege consoles with the YM2612: Genesis Model 1 with motherboard revisions VA6.8 or older, and a VA2 or VA2.3 Genesis Model 2 with mods (still have to tweak the low-pass filter as it's a bit too heavy on the VA2 and VA2.3 Genesis Model 2 motherboards). Note to MaxWar: if your Genesis Model 2 has motherboard revision VA2 or later, you don't need the Audio Mod. Ace wrote: Same with the Genesis 3 and Sega CDX, they all have good audio, though the former is Mono only. They still can't match a Genesis Model 1 due to the use of a YM3438 instead of a YM2612. The YM3438 has different volume levels and little to no quantization noise. I typically frown upon consoles with YM3438s as the Genesis first came with the YM2612, and since the two chips sound different, I will privilege consoles with the YM2612: Genesis Model 1 with motherboard revisions VA6.8 or older, and a VA2 or VA2.3 Genesis Model 2 with mods (still have to tweak the low-pass filter as it's a bit too heavy on the VA2 and VA2.3 Genesis Model 2 motherboards). kool kitty89 wrote: Aside from the filtering (which can also be controlled via mixer/receiver externally), it would just be the bugs and subtle differences to the sound of the original YM2612 that would make the difference . . . and that's largely up to personal preference and dependent on the sound/music in question. This is not a question of personal preference, it's a question of what sound chip the system originally came with. The Genesis originally came with a YM2612, not a YM3438, and as such, I will always privilege a Genesis with a YM2612. NO EXCEPTION. Alright guys, as much as i find the subject of Genesis motherboards to be a genuinely fascinating one, i am now officially reverting this thread to its intended purpose. Not an OPL3 card, but I did my first recording on a Sound Blaster 1.5 CT-1320 C.
I found the whole task quite time consuming but I guess this can't be avoided. The more games the more work I guess. Descent sounds weird, like slowed down at some parts. Something similar can be observed with Descent 2. Apart from that all went well, I had no issues. I'll paste the link here as soon as it has finished uploading (it's over 100MB). Last edited by Mau1wurf1977 on 2012-7-29 @ 05:41, edited 1 time in total. Mau1wurf1977 wrote: I found the whole task quite time consuming but I guess this can't be avoided. The more games the more work I guess. I am getting very comfortable with the recording process and usually just do other things at the same time so the recording itself is really not too bad. It looks very nice!! According to the seller I think its School surplus material. Considering how near mint it looks, im wondering why its missing the Potentiometer. But it looks like it has been carefully removed and not "ripped off "
I'll work on finding a replacement for it this week so i can record this beauty. I hate this card. I have both this and the Vibra16C Prelude CT2960 and hate them both. No OPL3, HIGHLY prone to stuck notes... that's enough for me to chuck both my CT4180 and CT2960 in my bin of spare sound cards. And you know what? I would even chuck a SoundBlaster AWE64 Gold in my bin of spare sound cards. I WILL NOT ACCEPT OPL3 CLONES IN MY DOS GAMING RIGS! Ever. 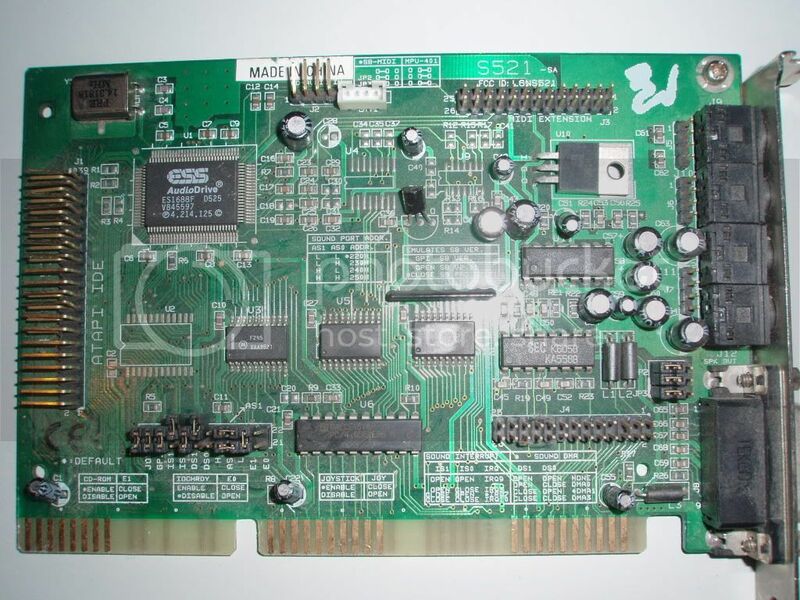 On a related not: Ace, did you ever end up finding a PCI YMF7xx based card? You've got an XG synth card listed in your Doom sound comparison, so you must have been using one of the PCI YMF724 or 744 at some point, but you didn't add that to the X-Wing compairson. I have 4 different Yamaha cards: a YMF719, two YMF724s and a YMF744. The Many Sound of: Doom - Part 1 uses one of the YMF724s (a cheap generic YMF724 with a fake Game port and no SBLink, but I do have one with a working Game port and SBLink for use on my MS-DOS test PC). All PCI-based Yamaha YMF7xx cards use SBLink. The SoundBlaster Live! uses no SBLink whatsoever. You're probably thinking of the PCI-based AWE64D where using SBLink is a REQUIREMENT to get DOS support. The ESS Solo-1 and Maestro-2 also use SBLink, though you shouldn't use the Maestro-2 as its OPL3 clone (a software-emulated YMF262, maybe? It sure sounds like it to me) is just weird and tends to output notes as buzzing noises. This is a sound card I'm interested in hearing. I have a clone of this card that has faulty PCM audio out of the right audio channel and nothing I do fixes this. I would really like to hear what the real SoundBlaster Pro 1.0 sounds like. Does it hiss at all times or only when the OPL3 is active? I know my SoundPro HT1869V+/CMI8330 is EXTREMELY noisy when its OPL3 is active, but very quiet otherwise. Good luck with this card 'cause it's a piece of crap. OPL3 usually works, but its SoundBlaster 16 support is almost 100% useless. Oh God, that's one of those Ensoniq AudioPCI-based SoundBlasters, is it? That's gonna sound BAD! THE GRAND OPL3 COMPARISON RUN NEEDS YOUR HELP!! With all the new recordings coming in, the dropbox account I use to host the files will be full. I currently have max 3gb on it. If you do not have yet dropbox you can be a great help to this project simply by registering using this link then installing the dropbox plugin. It is a very useful tool and each registration will give a referral and a 500 mb bonus to the project. Official file update #3 !! -2 I added a page about the games used. -3 Mau1wurf's Excellent recordings of his CT1320C are online. I noticed something interesting while listening. Seems like one of the channel is slightly more noisy than the other one, i experienced the same thing on my CT1350B. At first i thought it might have something to do with a dirty potentiometer but it just would not go away even after a thorough cleaning. Interesting that both cards have it! No big deal anyway, the output quality and STN ratio is still better than many later sound blaster cards! -4The Sertek S521 sound card testing and recording is done, a somewhat funny card! Looking at weirdstuff yesterday, I saw a Vibra 16S with a YMF289B rather than the usual YMF262. Looking at the datasheet, it seems to be nearly identical to the normal OPL3 except with support for 3.3V operation (in addition to 5V), a low-power sleep mode, and uses a QFP rather than inline SOP. 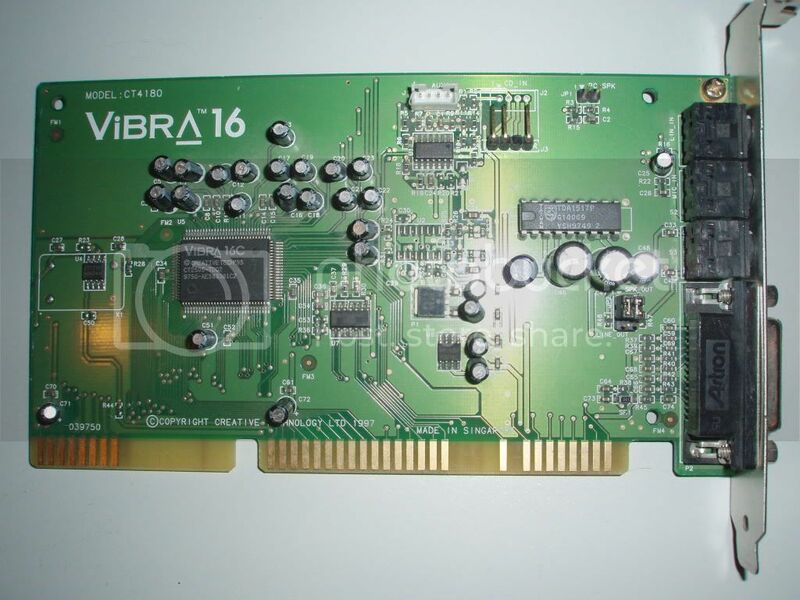 Not sure if it's worth buying for a comparison though; the board appears otherwise identical to typical Vibra 16S cards, so unless there's any real difference to the YMF289 itself, there's not much point in bothering. I also took a look at several ESS Audiodrive cards they had, and all had a weird additional edge connector past the 16-bit ISA extension with an extra 6 pins (3 per side). I'm not sure what that's for or what sort of motherboards supported it. 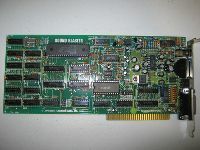 I have an AudioDrive ES1869F that has the extra pins, and I think it was made specifically for some Compaq computers as there's a Compaq logo on that particular card. The card works even with those pins connected to nothing, but I really have no idea what those pins could be used for. This stuff is really interesting guys. I sure would like to listen to the YMF289B. Or at least know if the low power option is really the only difference. An AudioDrive ES1869F that has the extra pins is just the kind of thing that is very welcome in this thread, sure makes you want to study those chips just for the sake of solving mysteries. By the way, I have a variant of the CMI8330 labelled as the SoundPro HT1869V+ built into a PC Chips Socket 7 motherboard. Shall I get some audio samples recorded off this thing?